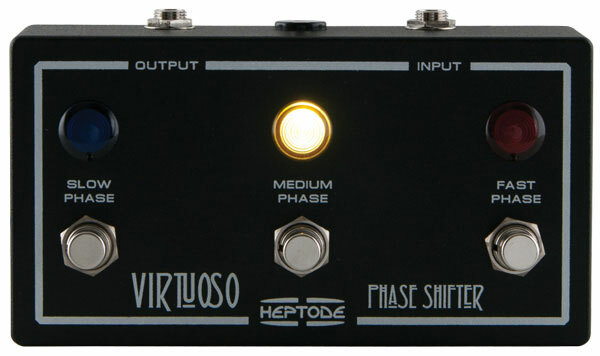 This month we are giving away a Virtuoso Phaser from Heptode courtesy of Owner/Operator Jean-Luc Chtioui who is located in Orsay near Paris, France. Jean-Luc started buildng effects and ampliers in the early 80’s, but soon found himself working in the telcom industry and his work in electronics faded. Until around 2005, when he decided that getting back into the production of effects and amps seemed like the right choice. It turned out that it was. 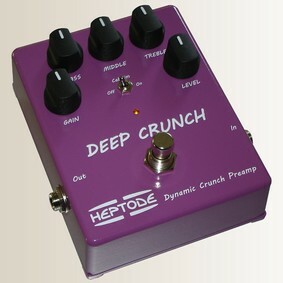 Today, Heptode has three prime effects on the market; the Virtuoso, the Deep Crunch and the Heavy Tone. And artists from all over the world are taking note. We sent some questions out to France and Jean-Luc was kind enough to reply. This is how that went. Do you have a specific method for researching a new pedal and developing it into a working model or do you draw inspiration from multiple places? Searching for an original idea for a new pedal is a difficult task. There are so many pedals on the market and the challenge is to develop something new. I usually have multiple discussions with my US distributor European Musical Imports to identify vintage sounds and effects we both like. As far as the design itself, I don’t have any specific method. My goal is always the same: to reproduce revered vintage sounds with modern technology. When I came up with the idea of my first two pedals (The Deep Crunch and Heavy Tone) I was inspired by the voicing of the Soldano SLO-100’s two channels and was able to develop a unique design to simulate the sound of a tube amp. Our newer pedal is called the Virtuoso: a boutique re-creation of the terrific Maestro PS-1A phaser, which we both loved the sound and simplicity of and believed there was a market for. Three preset speeds but with a wonderful, lush tone that (when changing speeds) ramps up or down like a real Leslie® and was used by many professionals on numerous recordings and live performances in the late sixties and into the seventies. For the Virtuoso, the starting point was the original schematics. After some time, I discovered that the PS-1A’s magic was due to both an intelligent design as well as small “defects”, which were characteristic of the original components that were available and used back in the day. The trick was to reproduce these defects with modern components, and to improve what could be improved without touching the magic: reduced noise level, pedal board friendly size, choice of battery or AC adapter, etc. If we dropped by the Heptode studios, what would we see? Give us a written tour of your space. Heptode’s workspace is a bit messy like many similar one-man workshops. You will find high-end equipment for SMT assembly: a stencil printer, a semi-automatic pick & place machine and a reflow oven as well as all the traditional test equipment that I use to design and build the pedals (scopes, generators, etc.). I’m also a well-known amp tech in the Paris area so there are always all kinds of guitar amps, pedals and even the occasional hi-fi tube amplifier in for maintenance or repair. Many professional and amateur musicians come here regularly to drop off their amps and many of them seize the opportunity to check out Heptode products and prototypes. When did you craft your first pedal and what is the number one thing you’ve learned the hard way. I built my first amps and effects when I was a teenager in the early 80’s, but they were not designed by me. My first self-designed pedals were built in 2006. What I learned the hard way is that it’s essential to have patience and determination in spades. When you start from scratch like I did, it takes much more time than I expected to achieve your objectives despite my training and decades of experience with analog and digital technology in the corporate world. If Heptode were a song, what song would it be? I would say Stargazer from Rainbow’s 1976 album Rising. No specific relationship with Heptode. But it was one of the very first albums I bought, and I listened to it literally hundreds of times when I was a teenager. Stargazer is an amazing song. 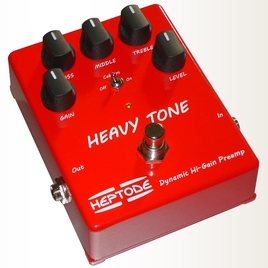 Is there a pedal or cabinet tone that you’ve been chasing, but just haven’t caught yet? I’ve been working on getting the Fender Blackface tone in a pedal for a while now. It was one of my first projects. It’s come a long way and fortunately I’m starting to see the light at the end of the tunnel. What is your #1 piece of advice to those who are diving into their first pedal build/mod. Any reference material in the library or on the Internet that you think they should look at? My #1 piece of advice is to be innovative. Even if you are reproducing vintage sounds and effects, bring something new to the table. Building a pedal is like composing a piece of music. As far as technical reference material, I mainly use original schematics of pedals or amps when they are available. You can learn a lot by analyzing schematics in detail. When I began designing pedals, my objective was always to create something different. I don’t have any real camaraderie with other effects builders. There are not very many in France. We occasionally meet each other to chat, but that’s about it. I am in contact from time to time with some builders worldwide, particularly when I need technical support for repairing a specific pedal or amp. And yes of course, a pedal can be amazing when it sounds really good, or when it’s very original, or when there’s a real technical challenge behind it. And then I wish I had the same idea! When you and your Heptode crew aren’t building awesome effects pedals, what do you do to pass the time? Any hobbies or games you like to play? I’m a one-man shop since I started the company 5 years ago so most of my day is spent with Heptode related business. I try to spend some time every evening (and weekends) with my family. Before I started Heptode, I worked in the telecom industry as an electronics engineer. The combination of music and electronics was my hobby. Now it’s my job and I love it! What does the future hold for Heptode? Any upcoming news or events we should know about? 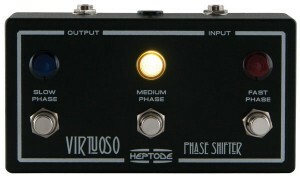 We will continue to focus our marketing efforts on the Virtuoso pedal. It’s becoming a reference among phaser pedals. We were very happy to learn that Chris Shiflett has been playing it on the Foo Fighter’s new album, and it’s now being used at some well-known studios in New York and Los Angeles, where it’s getting some recognition with their varied clientele. As far as upcoming events, I’ve been working on a very ambitious guitar amplifier project, which should be launched within the next few months. It’s a bit too soon for details, but I can say that it will be small, lightweight, powerful, robust, innovative, and it will sound like a legendary amp. Actually the ideal amp to be played with pedals! Do yourself a favor and check out Heptode’s website to learn more and make sure you like them on Facebook.